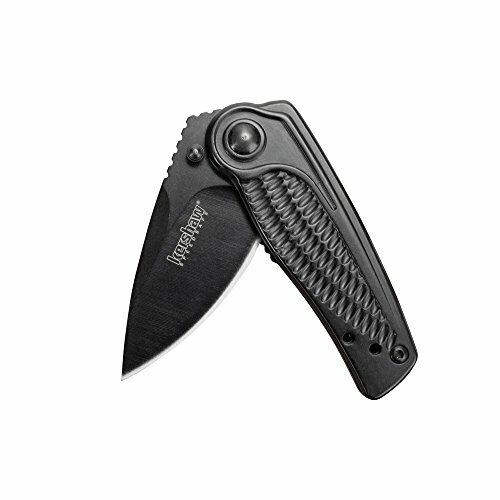 Measuring a mere 2-inches, Kershaw’s Spoke is easy to take anywhere. Even with such a compact blade, the Spoke proves highly capable. The 2” stain resistant 4CR14 steel blade slices through tasks quickly and easily using its big belly that provides plenty of cutting surface in a short, compact blade. With ultimate user safety in mind, the Spoke’s steel handle is designed with a slightly oversized flipper that doubles as a finger guard, a sturdy liner lock to secure the blade open during use, and a unique textured pattern to provide a strong, sturdy grip for confident handling. A sleek black-oxide coating gives the Spoke its stealthy appearance while adding extra corrosion resistance. Equipped with SpeedSafe assisted opening and a built-in flipper, the knife is quickly available for use in any situation. Rounding out it’s expertly crafted design, the Spoke’s reversible deep-carry pocket clip is adjustable for left or right-handed use, offering lightweight discreet carry when needed.